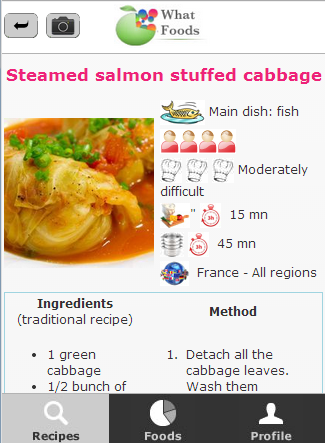 6 Why define his tastes? 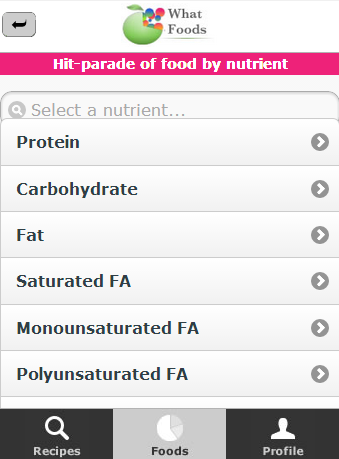 This function allows to search food (from the base Ciqual: learn more) having for 100g, the highest values on a selected nutrient values. 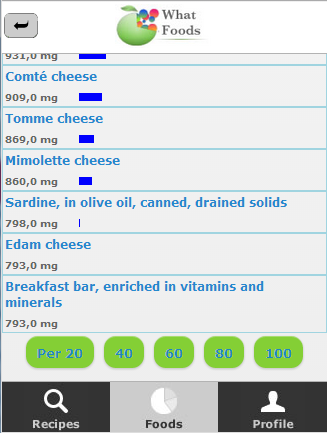 For this, as shown in the screen below, choose a nutrient in the list of 37 possible (proteins, carbohydrates, fats, minerals, trace elements and vitamins), or indicate pnly the first letters (ca in our example), to reduce the size of the list. 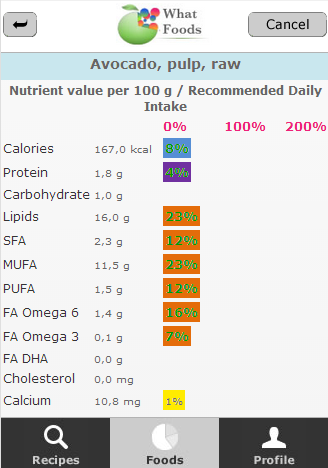 Viewing a food make a display of values ​​for each of 37 nutrients, relating these values ​​to the recommended daily intakes as a percentage. 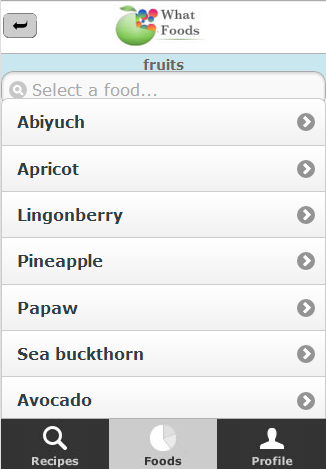 It appears then the list of all the foods of this family. 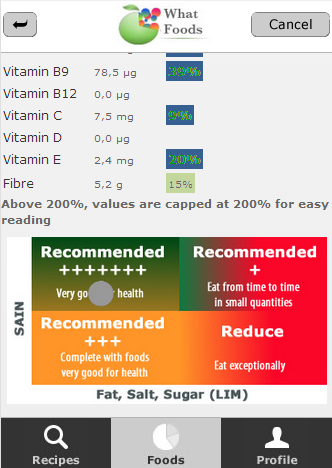 To view the nutritional analysis of the food, it should display "nutritional food" contained in Ciqual bases and Fcen. 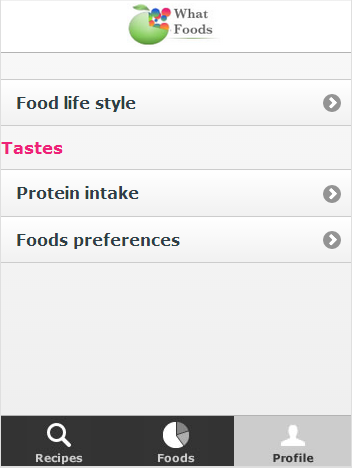 Viewing recipes is done using a personal profile (food lifestyle and tastes in free application). 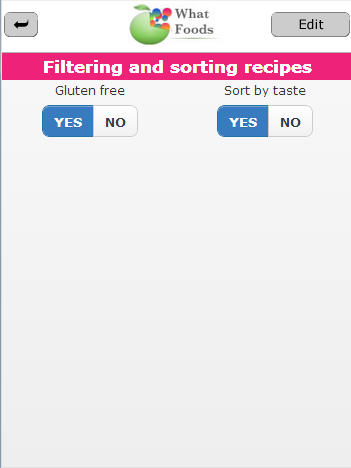 After filling in the required information and submitting the form, you will go directly to the recipe search. 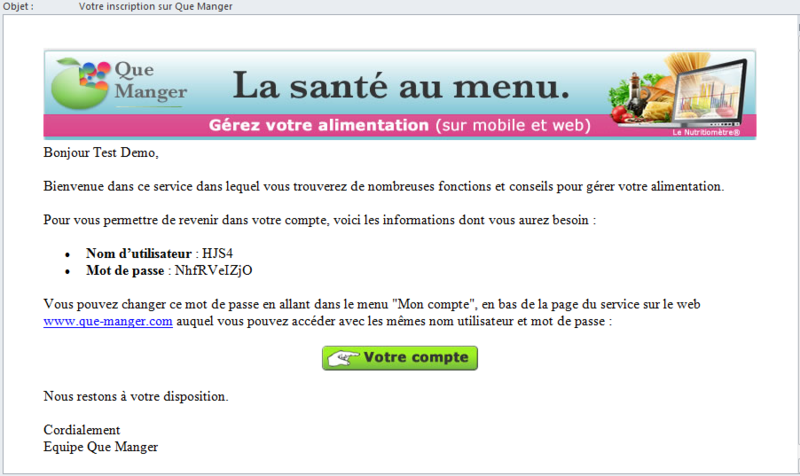 You receive an email in parallel with a reminder of your user name and password you have created. 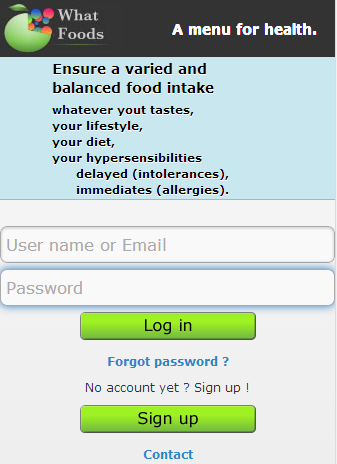 You can change this password by going to the website What Foods, by accessing your account with the same information, and going to "My Account". 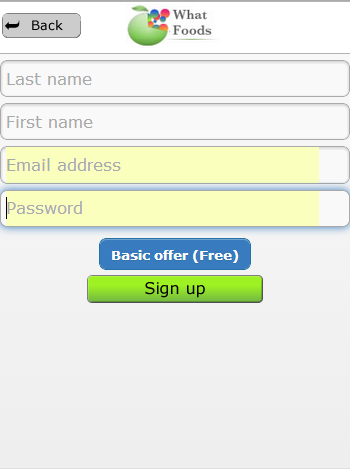 Nota: you can only create one account on your mobile. 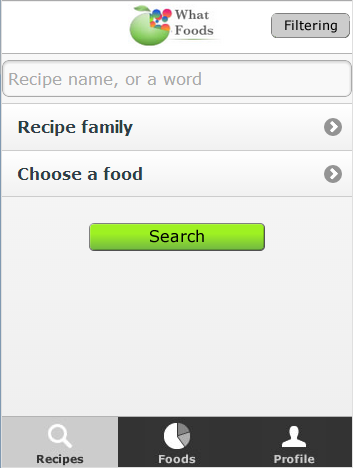 However, others persons that have an account What Foods can access to search recipes, giving their login and password. 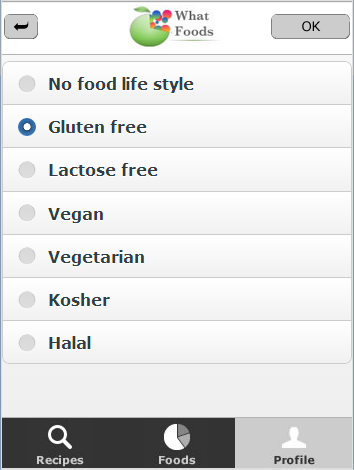 Just choose the one you want, and validate. 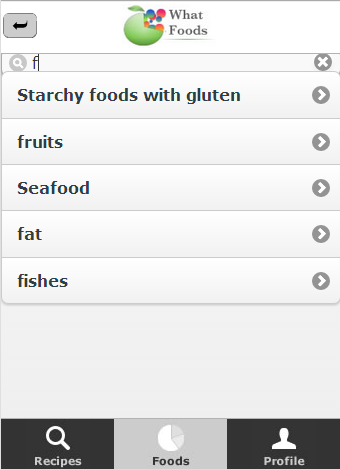 Your food preferences (also known tastes in the application) can sort the recipes in search of them. 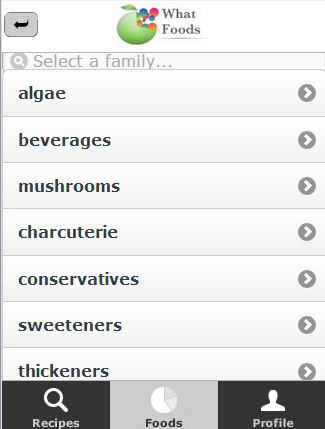 If these options are not set, recipes appear alphabetically by their name. 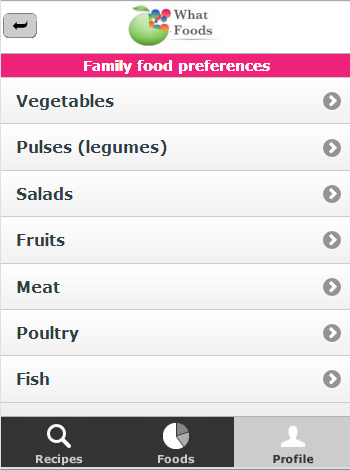 We recommend you to think about your personal settings, for targeting what is essential. 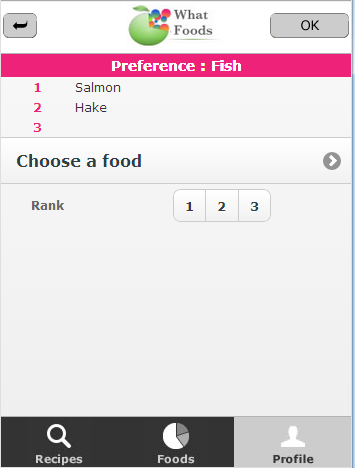 Indeed, too many input parameters can be "contradictory" and you do not get the sort result you expect. 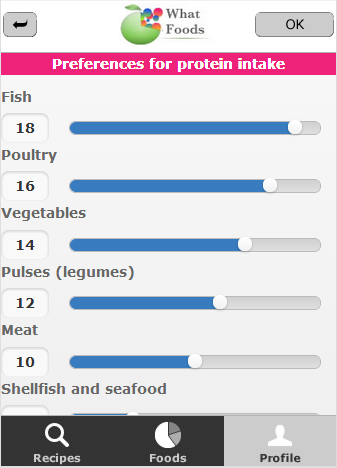 For the classification of food groups to protein intake, we recommend that two families do not have the same "weight". 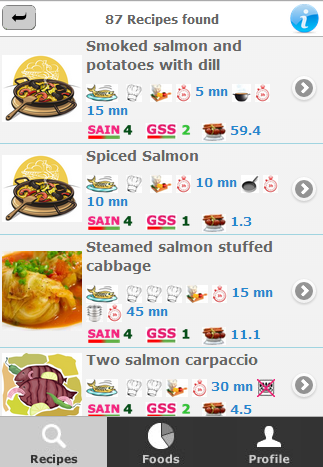 After assigning these values ​​to the families and validated, these families will be classified according to the order of preference, allowing you to more easily verify that the two families do not have the same "weight"
To view the recipes, the customer must be registered for the service What Foods (on his mobile, or www.what-foods.com internet site). 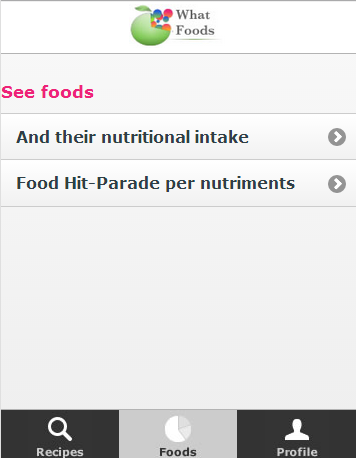 Containing food. 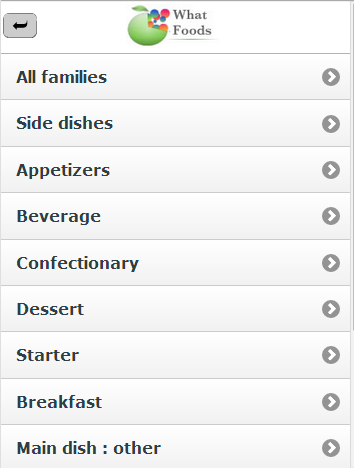 As for the families of recipes, it will appear a list of foods in which you can choose. 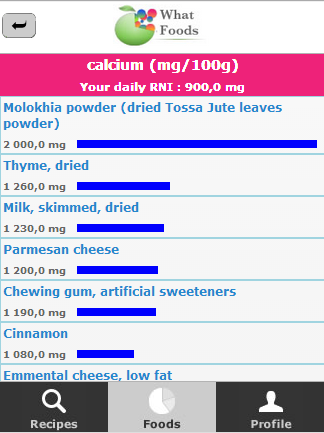 Be carefull, this list can be long. 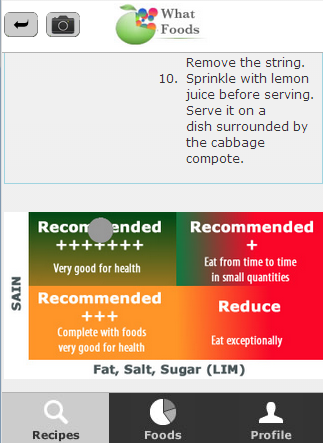 We must therefore consider the need to choose a food, knowing that may be setting your food preferences facilitate what you are looking for. 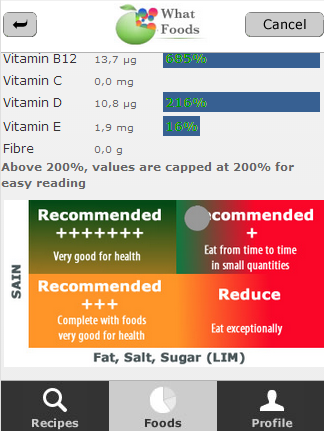 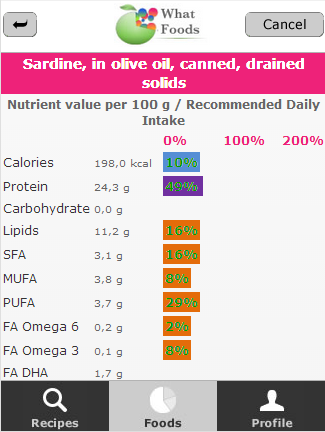 Nutritional summary of the recipe is presented as for food, with SAIN and LIM indicators. 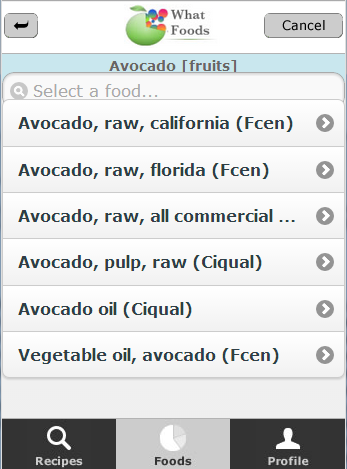 You have the option to list, if you're interested, the nutritional composition we added revenue (from Ciqual and Fcen bases), and also allows for the "filtering" of recipes following the food lifestyle.